Bake the biscuits according to package directions. Remove from the oven and set aside. Use an electric mixer to whisk the cream cheese at high speed until it is soft and fluffy, about 2-3 minutes. Add the sugar and vanilla, and continue whisking until well incorporated. Lower the speed to medium and, while the mixer is still running, slowly pour in the heavy cream, gradually, in a thin stream. Stop, and use a spatula to scrape the bottom of the bowl to ensure that everything is well combined. Continue whisking at high speed until the cream forms stiff peaks. 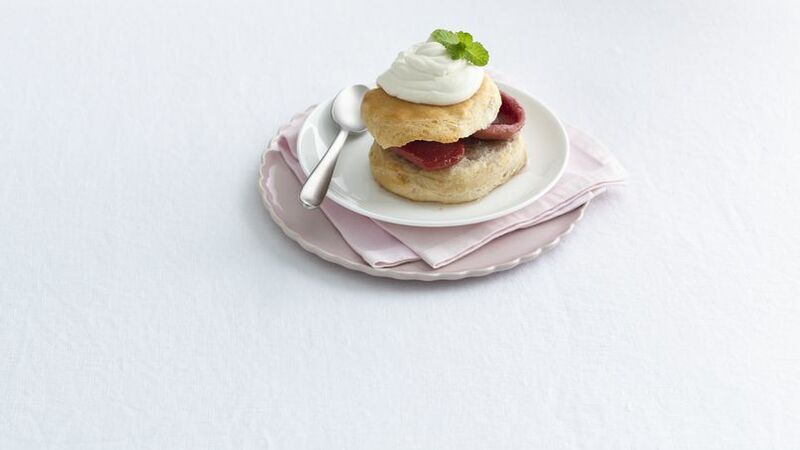 Cut the biscuits in half, place a couple of guava shells and garnish with whipped cream to taste. If you wish, you may substitute fresh mangoes or strawberries for the guava. Oriana Romero In my home, we all love guava! As a child, I remember spending summers climbing the guava tree on my parents’ farm. This recipe brings back tasty memories of my childhood, and the cheese and heavy cream mixture gives it a delicious flavor!